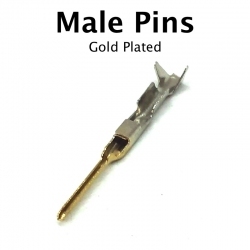 Replacement male pins to crimp onto cable to fix motor, sensor, or extension wires. Why throw out a good motor just because a pin broke off, now you can easily repair it with inexpensive parts from Robosource.net. See full description below for more repair information. All of our crimp pins are gold plated (identical to VEX® pins) for higher durability: most pins aren't gold plated and not intended for being plugged/unplugged frequently. Kits to repair a whole connector also available.